This Vashikaran Yantra makes the use of both Sindoor and Drinking Water to put a Voodoo Attraction Vashikaran Spell on any person who drinks the water from the Vessel or Water Container on which the Spell has been Cast. The process is basically very simple and suitable for the layperson to practice. However, I will not guarantee its success as this largely depends upon the strong will power of the Spell Caster and his intentions not to misuse the Yantra for harmful purposes like enticing a man or woman solely for the purpose of physical relations against their will. 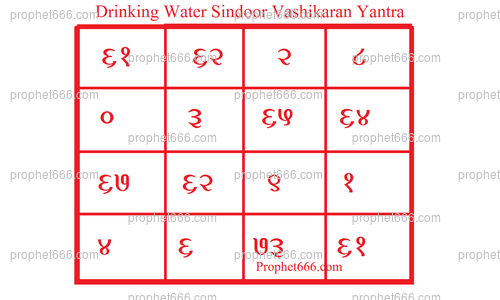 The Vashikaran Yantra should be drawn as shown in this image beneath a Vessel containing drinking water. It has stated above should be drawn with Red Sindoor Paste [Red Vermillion], to prepare the pasted a few drops of water have to be mixed with the Sindoor Powder to prepare a thick paste. Any pointed instrument can be used to draw the Vashikaran Yantra. Any person, who drinks the water from that Vessel, will become attracted towards the practitioner and come under his management and control. This Spell can be Cast on any day and time and no other rules or strings are attached to this Peene Ke Pani Vashikaran Yantra Prayoga.